Thenga Manga Pattani Sundal is served in South India (Tamil Nadu) all over the tourist spots, Bus stands, Parks, Beach, Road sides.. etc. Generally prepared using Pattani (Dried Green Peas). Here I have made this Sundal with the combination of Channa/ Chick Peas, Peanuts and Soya Beans to make it more healthy and also tasty. This is snack can be prepared in a jiffy without much effort. 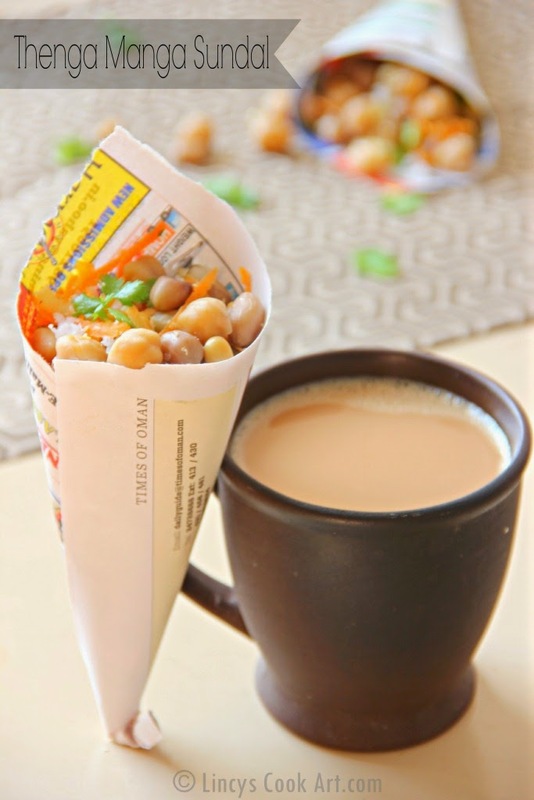 This simple snack can be prepared for Evening Tea time snack, Picnics and also can be sent for Kids Snack Box. By adding this healthy snack you add proteins to your diet and stay healthy. It is always better than a fried snack taste wise and also health wise. Mango gives slight sourness to the dish, Carrot and Coconut gives mild sweetness, Onion and chilli powder gives touch of spiciness. You can feel various taste and texture combination in this Sundal. Soak channa, peanuts and soya together in a bowl overnight or about 5-6 hours. Pressure cook the channa, peanuts and soya together with salt on medium flame for 3 whistles. Drain the cooked water and mix the sundal with grated Mango, Carrot, Coconut and chopped onion and coriander leaves. Toss and mix well sprinkle chilli powder if you like and serve hot. very easy yet healthy dish. Favorite for all ages & healthy too . perfect pic!! Mango surely elevated the flavors to another level. Flavorful and tasty...... Love it!! Very interesting and tasty recipe; back to childhood memories. Am ready to have this thenga manga sundal rite now,makes me nostalgic.